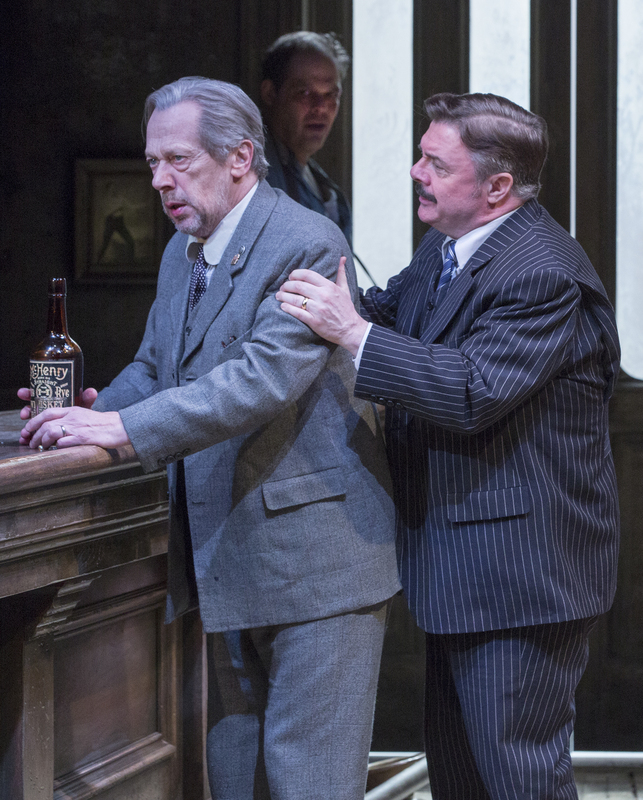 Eugene O’Neill’s nearly-five-hour masterpiece The Iceman Cometh unfolds like a more poetic marathon of the A&E series Intervention, with the sad-sack denizens of Harry Hope’s dingy saloon and boarding house spinning their wheels in a perpetual whirl of hung-over avoidance and denial. (Talk about soul-cycling.) Director Robert Falls’ riveting revival, first mounted at Chicago’s Goodman Theatre three years ago and playing at Brooklyn’s BAM Harvey Theater through March 15, demonstrates just why we continue to be drawn to this sadly timeless story of hopeless cases who cling to their vices despite the best efforts of everyone around them for self-improvement. In Iceman, the would-be change agent is Theodore Hickman, universally dubbed Hickey, a traveling salesman with a gift of the gab who descends on Hope’s circa-1912 tavern on the Bowery twice a year for a stakes-blowing bender in which he picks up the tab for all the regulars. This time, though, Hickey arrives newly sober — and intent on prying his friends from the delusions and “pipe dreams” that have hobbled them for so long. Like many a comedic actor, Nathan Lane displays both easy charisma and hidden depths that he’s exploited all too infrequently on stage and screen. Here, he easily convinces us of Hickey’s many facets — the joke-telling camaraderie that makes him such an eagerly awaited visitor; the smooth-talking of a preacher’s son turned salesman who’s always looking to close the deal; and the nihilistic hypocrisy borne of focusing on other people’s issues rather than turning a mirror on his own. Lane projects a missionary fervor, as if rocking on his heels at an unseen pulpit. 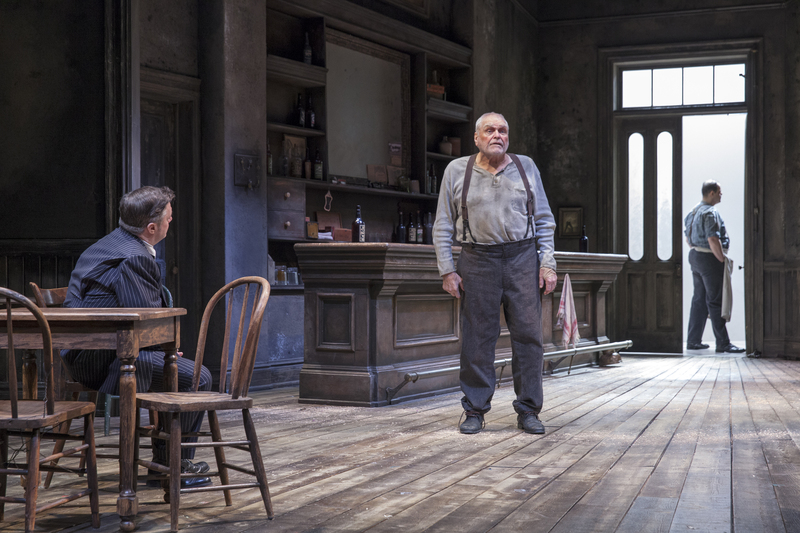 His approach is calmer, less frenetic than that of Kevin Spacey, who barreled through Hickey’s lines with an almost manic intensity in a fine Broadway revival in 1999. 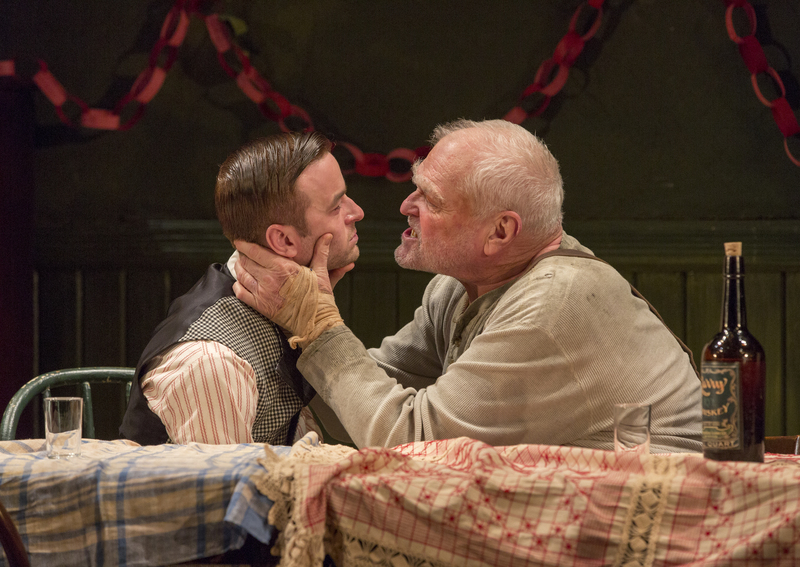 Brian Dennehy, who played Hickey in a 1990 Chicago revival also directed by Falls, here brings consummate soulfulness and a hunched-shouldered gravity to the role of Larry Slade, the retired anarchist and barstool philosopher who proves most resistant to Hickey’s appeals for unblindered truth and change. Larry is in many ways the heart of the production, keeping his cool as his comrades at arms (and elbow-bending) descend into Springer!-style shouting and tussling in their reluctance to accept Hickey’s suggested life hacks. The rest of the cast is notably strong, even when passed out at dimly lit bar tables. Standouts include Stephen Ouimette as the world-weary Harry Hope, who’s refused to leave his bar in the two decades since his beloved wife’s death; Kate Arrington as the streetwalker who finally persuades her fella (Marc Grapey) to tie the knot but soon balks at the farming life that had long been her stated goal; and the great John Douglas Thompson as the bar’s lone African American, a down-on-his-luck gambling kingpin who commands both respect and derision despite/because of his race. 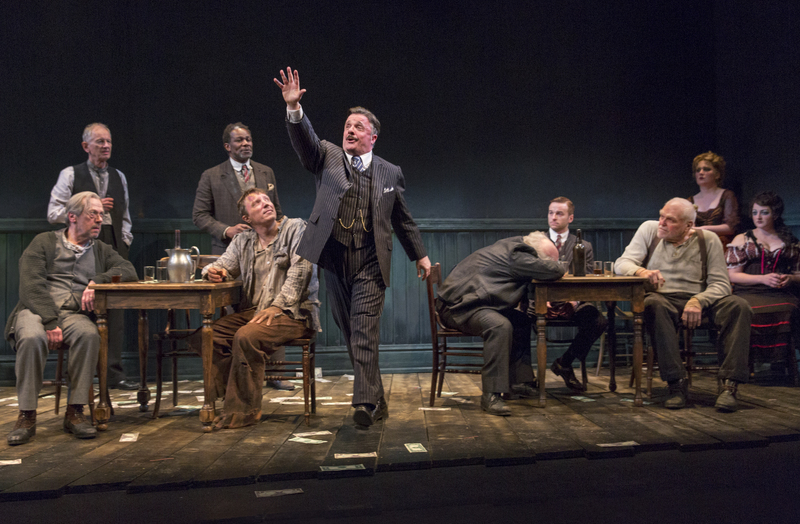 Falls’ production embraces its century-old setting with period-perfect details: The barroom set, designed by Kevin Depinet and lit with brilliant subtlety by Natasha Katz, looks as if it could have been lifted from an Ashcan School painting by George Bellows or John Sloan. The director has a clear affinity for O’Neill, who explored the American capacity for self-delusion before the advent of reality TV made the phenomenon ubiquitous.